The Moqups Blog – Moqups is a streamlined web app that helps you create and collaborate on wireframes, mockups, diagrams and prototypes. When you select ‘Create hotspot’, the ‘Show hotspots’ option is now automatically enabled. ‘Show hotspots’ now works reliably in Safari. Diagramming was once a tool used primarily by System Architects and Business Analysts. But now, almost every kind of project begins with someone – or some team being tasked with creating diagrams. But since then, we’ve been amazed at how consistently our customers have incorporated diagrams into their Moqups workflow. 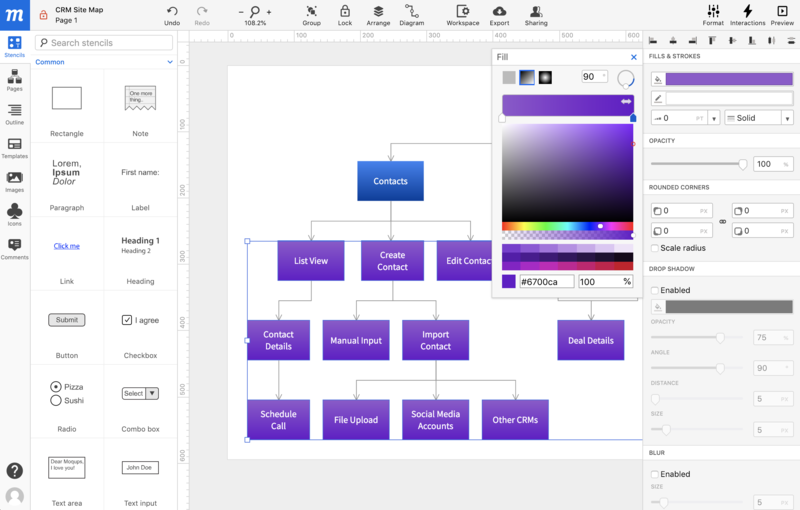 In turn, we’ve been busy improving and refining the diagramming experience. Lots of teams turn to Moqups for diagramming because complicated, expertise-specific software tends to discourage collaboration and experimentation. As a result, our goal has been to make it possible for all kinds of stakeholders to skip the learning curve and get right to work. At the same time, we also know that our high-end users want to stay within Moqups’ creative context when they diagram. And they want rigorous professional capability. That’s why we’ve added new UML Class, Use Case, and ERD Model sections to our Stencil Library, and have added a full range of Crow’s Foot start-and-end markers for diagram connectors. This is a huge workflow accelerator! When you’re mapping out ideas, it’s distracting to keep going back to the Stencils Panel to add to your flowchart. Now, you don’t have to. Selecting Flowchart Diagram, UML, or ERD Model stencils on the page will reveal arrows on all four sides of those objects. One click on any arrow will automatically duplicate the object, connect the two, and open text-edit mode so you can quickly name the new object. When there’s an object immediately adjacent from the one you are ‘extending’, clicking the extenders will automatically connect those two objects. And, as you add new stencils to your diagram, the page automatically scrolls to the end of that flow. For lightning-fast work, there’s also a keystroke: Shift + Alt/Option + Arrow keys will quickly add and connect objects. We all know the drill: You finally have everything styled and perfectly in place. But suddenly, the requirements have changed, and now you have to update a bunch of the flowchart symbols you’ve used in your diagram. This is the kind of repetitive work that’s tiring, and can easily make polished work messy again. Previously, you would have had to delete the bad stencil, drag in the new one, style it to match, attach its connectors, and wiggle it into position. Now, you just drag a new stencil over one on the page, and drop when the ‘replace’ icon appears! This little keystroke makes it easy to change the direction of your relationships, or reverse your flow: Hold down Shift + X to reverse the start and end markers of any connector. That should be easy to remember since it’s the same keystroke that reverses the Fill and Stroke style when an object is selected. We’ve made a couple of significant improvements that make it quicker and easier to style Diagram connectors. The first is that your connector’s default style now adapts to your most recent choices. In other words, when you style a connector, any subsequent connector you create will automatically adopt that style – until you change it again. We’ve also made it easier to retroactively style connectors. Previously, if you wanted to mass-style connectors already on the page, you had to select and change them individually; now, you can select a group of connectors – and customize them all at once in the ‘Connector Style’ section of the Format Panel. This is a small but beautiful detail for the alignment-obsessed: Snapping now works to the center of objects as well as to their edges, making it quicker and easier to align objects. This global improvement is especially useful when you’re laying out flowcharts and diagrams in staggered formations. Finally, if you’re an avid user of our Diagram feature, we want to hear from you about your experience, suggestions, or advice. Write us at support@moqups.com, or just leave us a comment below! ERD stencils let your team design DB tables and their relationships right inside Moqups. We’ve also added new diagram connector styles and smart defaults, including Crow’s Foot notation. The deepening of blue as you move from dock to sea. The waves of color in autumn hills. The slow ripening from green to red on a mango’s skin. Subtle gradations of wet sand along a shoreline’s footprint. The sudden blush of a baby’s cheek. And the lustrous waves of orange, pink and blue as the sun finally leaves the sky. Gradients grab our attention because they depict momentous movements from one state to another. That’s why we take so many pictures of the natural gradients in our world – and in our lives. And that’s why a gradient was a natural choice for Instagram’s when they redesigned their logo in 2016. That controversial move began the rediscovery of gradients after the era of flat design. Spotify’s rebranding in 2017 – using gradients and duo-tone color – was a clear signal that gradients have become a significant trend. The rehabilitation of gradients is not just because they compel and draw our gaze, but because – especially in an era of hi-def screens – they are highly effective at moving a users attention through a design. Because the human eye invariably lands on the brightest point on the screen, and then follows changing hues and shadows to explore the page, gradients can be used to put the focus on a logo, to highlight content, or to coax the user’s eye below the fold. And by mimicking light sources, and providing shadow effects, they can add texture, depth, dimension, and realism to backgrounds, UI elements, and image overlays. A great gradient becomes almost a color onto itself – instantly recognizable and at the core of branding. Gradients have been one of our most requested features, and we are proud announce that to this powerful branding tool is now available for your designs. Gradients easily applied to both Fills and Strokes. At the top of the Color Picker Popover, you can choose from three Fill Types: Solid, Linear gradient, and Radial gradient. For gradients, select either Linear or Radial gradient. The Gradient Slider has two default Stops that can be moved back and forth to adjust the start and end point of the gradient. Click on a Stop to apply a color from the Color Field. The Stop will remain blue while active. You can make further color adjustments below by using either the Hue or Opacity sliders, or by selecting from a range of color swatches derived from the currently active color. To add more stops, hover over the Gradient Slider until you see the ‘+’ icon; click on the slider to add a new stop. To remove a stop, drag it downward until it disappears. Use the Flip icon on the right of the Gradient Slider to reverse the order of colors. The controls in the upper-right corner let you adjust the gradient’s Angle (for Linear) or Center (for Radial). For even more precision, you can set the Linear Angle by degree, or the Radial’s Center by X/Y coordinates in the accompanying input fields. The Radial gradient also has a Stretch option that expands the Radial gradient to the margins of the object. As always, we love your feedback! So play, experiment and work with our new Gradient feature, and let us know about your experience, suggestions, or advice. Write us at support@moqups.com, or just leave us a comment below. If you use the keyboard shortcut Ctrl/Cmd + V to paste pure text directly onto the page – either from within the app or from an external source – Moqups will automatically paste the copied text in a new Paragraph stencil. The Fit page to content feature (accessed through the right-click Context Menu) now gives you the option of setting the spacing (padding) around your content.